¡Feliz Cinco De Mayo! As I promised yesterday, today's entry features "Coco" and the other animated film nominees at the Saturn Awards. From File 770, here are the categories in which it and the other animated films are nominated. While "Coco" won the Academy Awards for Animated Feature Film and Original Song as well as all the Annie Awards it was eligible for and "The Boss Baby" earned a nomination for Animated Feature Film at the Oscars, that does not guarantee either a victory at the Saturn Awards. While eight of the last fifteen winners have also won the Academy Award for Animated Feature Film and four others have been nominees, three winners were never nominated for an Oscar, including two of the past three, "The LEGO Movie," which earned a Hugo nomination for Dramatic Presentation (long form) in a year marked by controversy, and "Finding Dory," which I expected would win and did in an apparent attempt "to rectify it not even being nominated for the Oscar while being the highest grossing animated film last year." 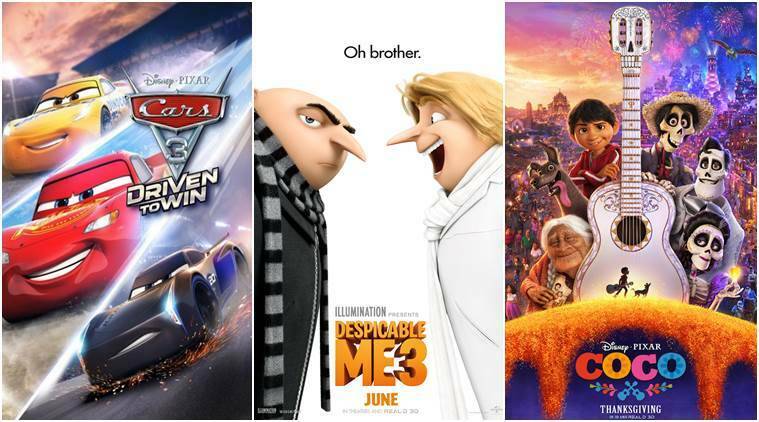 "Despicable Me 3" is in exactly the same situation this year as "Finding Dory" last year, so I wouldn't put it past the Saturn electorate to vote for it instead of my choice, "Coco." Remember, as I wrote first in Speculative fiction nominees at the 2018 SAG Awards, "the Saturn Awards are about entertainment not art, they don't care for subtle, and they love to stick it to the experts." With these caveats in mind, the nomination of "Your Name" makes perfect sense, as I've read nothing but good things about it, so I have nothing bad to say about its inclusion in this field. What doesn't make sense to me is the lack of a sixth nominee, which has existed in this category since 2014. I listed 19 animated films in Celebrate National Science Fiction Day with 'The Last Jedi' atop the 2017 box office, so it's not like there weren't enough movies for a sixth film. In particular, Oscar nominee "Ferdinand" or the third biggest animated film of 2017 at the box office, "The LEGO Batman Movie," would have been good choices. "Ferdinand" may have not had enough content of interest to adults, but I thought "The LEGO Batman Movie" would be a good fit for the Saturn Awards, so much so that I thought it might be the sixth nominee for Best Comic-to-Motion Picture Release instead of "Justice League" (that ended up being "Black Panther"). It's great entertainment, it's not subtle, and the experts, in the form of the Motion Picture Academy, ignored it. The only reason I can think of that makes any sense is that it was not eligible. It debuted on February 10th, so it may have been eligible for last year's awards instead, or it may not have been screened for the Los Angeles members, either in time or at all. If so, that's a shame. Follow over the jump for Coco's other nomination. Just like at the Oscars, "Coco" was nominated for and won (at the Oscars, not here, not yet) a second award. I'll be a good environmentalist and recycle the relevant section from 'The Last Jedi' and 'Star Wars Rebels' at the Saturn Awards for Star Wars Day. Four of the Oscar nominees for Original Score and two of the Oscar nominees for Original Song were eligible, as the films their music accompanied were nominated for at least one Saturn Award. Only four of the six earned a nomination in this category, "Coco," "The Greatest Showman," "The Shape of Water," and "The Last Jedi." "Dunkirk" and "Three Billboards outside Ebbing, Missouri" did not earn nominations. However, I wouldn't say they were snubbed; I was not impressed with their soundtracks. On the other hand, "Black Panther" is probably a good choice. As for my vote, it's split among "Coco," "The Greatest Showman," and "The Shape of Water." I doubt any of them will win, even (or especially) since "The Shape of Water" won the Oscar. Instead, I expect "The Last Jedi" to be the favorite. On the topic of music, here is "Remember Me" from "Coco," which I used in a comment to Midweek Cafe and Lounge, Vol. 49. Of course, this would not be a Cinco De Mayo entry of mine without a drink recipe from Tipsy Bartender, so here are some Drunk Frutas. We bought some fruit from a fruit stand and spiked them! Check it out! That makes two years in a row that I didn't post a margarita recipe for Cinco De Mayo. I feel accomplished. Finally, a reminder to vote. Click here to apply for an affiliate membership. At $25, one can vote for the best films and television shows. At $40, one can vote for all categories. I'm paying $40. I hope my readers do, too. *Yes, Guillermo Del Toro is Mexican, but the movie is very American, so I'll cover it in an entry about fantasy. Stay tuned.